GovSat-1 in Orbital ATK's Dulles, Virginia, Satellite Manufacturing Facility. After the launch comes the finger crossing hoping that the next steps go smoothly as well. Here Orbital ATK reports on the events that followed the recent successful launch of GovSat-1. Orbital ATK (NYSE: OA) announced the successful launch of the GovSat-1 multi-mission satellite that they built for GovSat, a public-private partnership between the Government of Luxembourg and world-leading satellite operator SES. 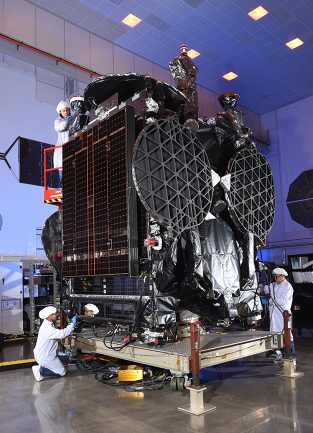 GovSat-1 launched aboard a SpaceX Falcon 9 rocket and marks the second GEOStar-3 satellite built by Orbital ATK to launch this month. It will be used to provide service to governmental and institutional customers. Liftoff occurred on January 31 at 4:25 p.m. EST from Cape Canaveral Air Force Station, Florida. The satellite separated successfully from the launch vehicle approximately 32 minutes into the mission after reaching its targeted orbit. Orbital ATK completed the satellite’s initial post-launch health check and configuration in preparation for 16 days of orbit-raising procedures and in-orbit tests. Once testing has been completed, operational control of GovSat-1 will be handed over to GovSat. Amer Khouri, Vice President of the Commercial Satellite business at Orbital ATK said that our initial testing of GovSat-1 shows the satellite is performing nominally. The company has previously delivered six GEOStar satellites to SES, one of GovSat’s shareholders. GovSat-1 demonstrates continued confidence in the company’s GEOStar products. GovSat-1 was built in Orbital ATK’s satellite manufacturing facility in Dulles, Virginia. It is an X-band and military Ka-band satellite that provides high-powered and fully steerable spot beams for multiple government missions. The satellite will be positioned on the European geostationary orbit arc and provide coverage to Europe, the Middle East and Africa, along with extensive maritime coverage over the Mediterranean and Baltic seas, and the Atlantic and Indian Oceans. The GEOStar-3 platform is the newest, highest power and most advanced platform in the flight-proven GEOStar product line. The spacecraft bus features an increase in both battery capacity and solar array power. An additional GEOStar-3 satellite is planned for launch this year.